In the early 1930s, France adopted a new standard pistol and a new cartridge to go with it – the MAS 1935 and the 7.65x20mm, closely patterned on the us M1918 Pedersen Device cartridge. They were well acquainted with the 9×19, but as always the French military marched to the slightly offbeat tempo of it’s own drummer. So with the new pistol cartridge in hand, they started testing submachine gun designs. The arsenal at St Etienne provided the best candidate in 1934, and after several years of testing and improvements, it was adopted as the M1938. Production began in 1939, and very few had gotten into service when German forces overran the factory in 1940. 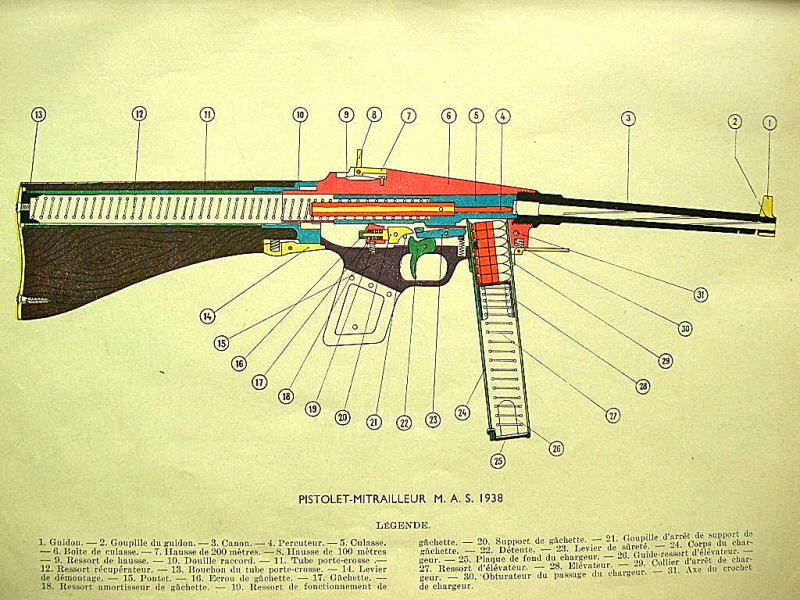 Production continued after the war, but it wasn’t long before the French switched over to the 9mm Parabellum, and the MAT-49 replaced the MAS-38. The MAS did see some use in Indochina, and was used to equip police forces and other secondary units. One element that is not necessarily apparent from photographs is just how compact the MAS-38 really is. The whole gun is just a hair over 24 inches long, and the barrel is a scant 8.7 inches. The receiver is narrow, and there are very few projections to snag on anything. (even the rear sight folds flush into the top of the receiver). The whole thing weighs in at about 6.5 pounds. That would make for controllability issues with many subguns, but the mild recoil from the rather weak 7.65×20 cartridge allows the gun to be pretty easy to handle. Of course, it lacks stopping power compared to just about any other subgun on the battlefield. Mechanically, the MAS-38 is a simple blowback action, firing full-auto only from an open bolt. The unorthodox element to its design is how the barrel and bolt travel are not parallel – the bolt travels downwards as it goes back, relative to the barrel. The breechface is cut at a matching angle to fit fully against the chamber mouth. This angle is partly to slow down the bolt (and thus the rate of fire) and partly an attempt to reduce felt recoil by using vertical travel of the bolt to compensate for it (this was also done on the Finnish Jatimatic and modern Kriss carbine to a more extreme degree). The bolt handle is non-reciprocating, and stays in the rearward position once the gun is charged. It can be manually pushed forward and will latch in the fully forward position, acting as a dust cover over the ejection port. Another folding dust cover is pinned to the front of the magazine well for closing off that opening when no mag is in use. There is no selector switch since the action is full-auto only, and the manual safety is actually built into the trigger. 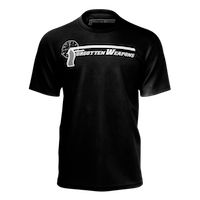 When pushed forward, the trigger will snap into a more or less horizontal position, and in the process lock the bolt in place (whether it is forward or back). You can see how this mechanism works by looking at parts 22 and 23 in the diagram above. Note closed magazine well and bolt handle which doubles as an ejection port cover. The sights on the MAS-38 consist of a triangular front post and a pair of independent flip-up apertures for the rear sight. The apertures are set for 100m and 200m, and the sights are offset slightly to the left side of the gun. The magazines have a 32-round capacity, and are of the double-feed design. Despite begin a pretty simple mechanism, the MAS38 is not a really simple weapon to manufacture. Its bolt is round in profile despite the square receiver, and runs in a round channel bored in the receiver. This channel also houses the recoil spring, and runs back into the wooden stock (and for this reason a folding-stock model was not made). Other than small pieces like the ejection port cover, the MAS38 was made with all missed steel components. As World War II would soon prove, subguns could be made much faster and at less cost by using mostly stampings. Disassembly, however, is very straightforward. Depress a spring-loaded catch under the front of the buttstock, and rotate it 90 degrees. The stock will then slide off the receiver, allowing the recoil spring and bolt out. The trigger frame can then slide out the back of the receiver (it runs in a pair of slots inside the receiver). Second video: was that last round an out of battery detonation? Always a problem in open bolt subguns. Sorry for the question, but, as brazilian, this expression isn’t clear for me. Out of battery detonation occurs, in this case, when the round stops before its final position and is fired without correct chamber support for its walls? I’m affraid from fixed firing pins because of this. Does this happen so often? French army have the Vollmer EMP35 in 9x19mm for Assault SMG. Perforation of the amuntion & accurancy was hight, but that’s lack of punch. * The Conversion in 9x19mm (9mm Luger) of the MAS38 is simple : Rebore barrel (or new barel) and adapation ofbolt face, the magazine could take 9X19mm amunition without modification. Well, they indeed had Vollmer SMGs inherited from Spanish republicans, but these weapons found their way in French hands only in 1939, were available in limited numbers (order of 3250), without chance to replenish. Moreover, they often lacked magazines (the French had much more these SMGs than magazines…) and were generally in poor shape, so only 750 were issued. So, they were pressed into limited service just because were at hand and should not be perceived as an important “assault weapon” of French army. Keep in Mind in 1939, German Army have not more smg than the French. At this time Britsh haven’t SMG in gerneral service. In French Militray Doctrine the Squad for support the Machine Gun Team (Like the german or British). The german MP40 arrive in 1940 (One year later) and just have few MP38 and old MP18. The massive dotation of SMG arrive with requipement of Soviet force (PPSH41 & PSS43) in 1942. Do not juge a period with moderne view. Yes, of course, but this is completely different story. 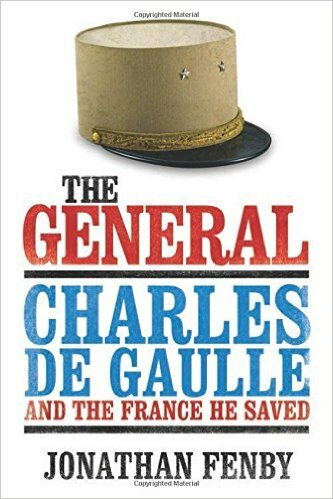 I only referred to your assertion that may suggest some special, “strategic” role of EMP in French army. Let’s look at their inventories: they had in May 1940 3000 Thompson SMGs, 300 Suomi M/31, some 1000 MAS M 1924, almost 2000 MAS Mle 1938, first 50 Petter Mle 1939, and also 50 ETVS (it seems that they were very determined to have in production as many very simillar, but technically completely not unified weapons as possible), some 200 MP 34 and 50 Steyr SMGs (I don’t know why the last two weapons are listed separately). Curiously, the much more useful Thompson and far more numerous, taking into account operational pieces, were issued only in several hundreds, it seems that they came to late and in general disorder the Army was not able to absorb them. Nonetheless, EMP was only one of many models, and by no means was intended as target, “strategic” “assault SMG” of French military. With all that said, you are right saying that MAS 1938 was perceived more as PDW (though it was also sometimes used by “groupes francs”, alongside with EMP or Suomi). I just picked up one of these MAS-38’s and would like to be able to convert it to 9mm. Anyone have a good source for parts and diagram or plans on how to open the bolt face to accept the 9mm round? Going to hit SARCO up for any parts they have and do some more research. Any and all help is appreciated. If you want a 9×19 subgun, there are lots of options out there – IMO you ought to leave the MAS-38 in 7.65mm. They are hard enough to find as it is (and they are not designed to handle the 9×19 anyway). I agree and can get the items to convert it and still have all the original parts to go back. I can get a barrel sleeve to fit in, mag works with the 9mm and just need to figure out the bolt face. Gun is in pristine shape and was a SOF bring back from South East Asia. I like this gun, it looks like true machine pistol. I also had chance to hold it and it feels as such as well. The salient feature of “culasse” running under angle may indeed reduce rate of fire and improve control as the video seem to show. The fact it’s receiver is not made out of ‘shxt-metal’ may cause some extra machining, but hard to tell if it affects the cost overall. To make and maintain stamping dies is not cheap either. It all depends on volume of production. Actually, one would think that if some upward force component of breech force is there, then solid chunk is better choice. MAS 1938 7.65mm SMG, using same magazines as above! Do recall that this is widely supposed to have been the gun that killed Benito Mussolini! I have always liked this design ever since I saw a picture of it in a book. I think a vertical fore-grip, like the one for the Thompson with a similar cantilevered grip mount, would have been a good addition. It looks like it would be too easy for careless fingers to find their way into the ejection port under stress. Another big merci to Ian for bringing this to us. was the one that SIG developed the epic P210 from. The French 7,65 Longue is indeed rather limp in the European climate but would pick up in Africa or Annan. then and reluctantly adapted the 9×19.Still ingenious to use a twin barrel lug, triangulating the barrel to improve accuracy, reduce wear and bring the line of sight down. REF : Line 3, third paragraph from the bottom — I think you meant “all-milled” steel components. The MAS 38 is a great example of an innovatve yet simple combination of mechanical operations that pre-date the supposedly ground-breaking actions of weapons like the KRISS. This is not to take anything away from the KRISS, which is a fine weapon, but the MAS 38 did it long before the advent of the former. I wonder if the designers of the KRISS were actually aware of the downward-traveling bolt and angled bolt / chamber interface per the MAS 38 and deliberately chose to adopt it, if they adopted the concept from the Jatimatic, or arrived at the same conclusion by coincidence. After all, there are only a limited number of mechanical actions and combinations of actions that firearms designers can use. By the way, the extreme compactness of the MAS 38 in spite of the fixed buttstock is actually readily apparent — it was the first thing I noticed looking at the topmost photograph ( this was also before I read your comments ) due to the proportion of the LOP relative to the rest of the gun. SNMP’s links to variations of this SMG with recoil tubes and telescopic or folding stocks are very informative. Thanks! Does anyone have additional data on how reliably the MAS 38 performed in adverse field conditions? * The designer engineer ( Renaud Kerbrat) of the Kriss hold French Citizenship. * The MAS 38 is reliably weapon, but the amuntion with nice perforation & accurancy (but with lack of punch) was a nice for PDW. * Another problème with this weapon (cognitive/ergonomic) that’s you could feed the mag in wrong position with bulet in wrong orientation. Thanks for the clarifications — much appreciated! The MAS 38 was in service with some units until the ammunition was deemed to be unreliable and there was no reorder as the conversion to 9mm was well under way. It is often reported that some magazines would dump their contents if the floorplate was disturbed. I never saw this happen nor do I know anyone it happened to.Mas 38s are very easy to clean and are both easy and natural to point and shoot. They are good in dusty environments and close quarters. The 7.65 x20 is not all that feeble a round and these weapons both penetrated well and were easy to keep on target. The fall of this weapon came due to politics and the decision to adopt 9mm. It is light and nice to carry and use. It was easier to use that the MAT 49 which while an excellent weapon is heavy and lacks the easy carry of the MAS 38.For those with legal live ones who want to shoot them the loads for the 1935 pistols made in the US are not powerful enough for proper function of the MAS 38. Just a crazy thought; given the proves of this design (namely the mentioned fire-rate reduction) and its capability to be upgraded with 9×19, if it was possible to use the idea for something even more powerful – such as 7.62×25. I am admirer of this caliber ballistics, if used in longer than pistol barrel. It’s very French in conception. Not useless by any means (unlike the M219 and M85), but so eccentric in some of its features (caliber especially) as to seriously impair its utility. Still the French would have been better off with more of them in 1940 than fewer. Of course having a million of them wouldn’t have made up for the fundamental deficits in leadership that caused France’s collapse. The only WW II sub gun with less power is the Japanese Type 100 in 8 mm Nambu. I have fired both the Japanese Type 100 and the MAS-38. They are both notable in that they are extremely controllable and easy to shoot well. The 32 Longue French round is the more effective round. A lot of the 32 French long was uncommon in that a lot of it was produced with a steel case and a turned steel bullet. The bullet naturally does not mushroom at all, but it does penetrate like crazy. It causes a lot of sparks when shooting in a quarry. 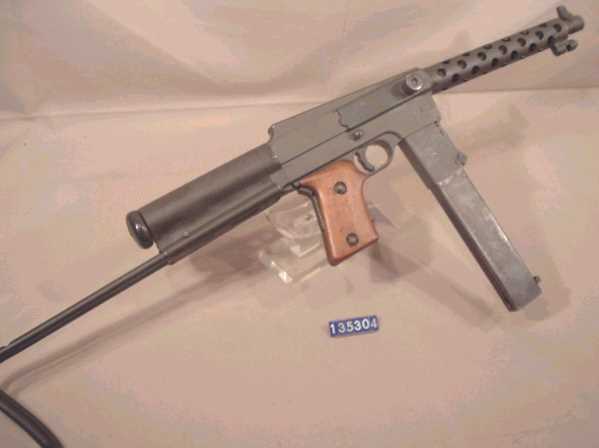 Shooting a 35 A it into wet Sears catalogues it went substantially farther than War time produced 9 mm from a 4″ Luger. It was not very far from the penetration of a 30 carbine round shot from a M 1 carbine. For you old movie buffs you can see a lot of MAS-38s used in the French movie ” The old Gun ” which will remind you to have a gun, even a double barrel shotgun with some ammo stashed away from your house in the event that some day you might need it badly. Turned bullets appear to be a “French” thing, since the 8mm Lebel Balle D rifle round was also loaded with a turned [brass] projectile. I’m curious to see fired cases from this weapon. Due to the angle of extraction, they must not be in good shape. Just fired my MAS 38 this evening after swapping out the deactivated barrel for a good one. Its a registered C&R transferable gun. I ran a few rounds through it for testing and found that unlike has been said previously it will run just fine on commercial ammunition. I also fired some reloaded ammo a friend loaded for his pistols. Everything ran just fine. Cases do have some damage but it has nothing to do with the angle of the bolt face, it is due to the feedramp machined into the barrel/chamber. It is unusually deep for a subgun and extends further into the chamber than most others. This leaves a bump on the case. I’m guessing that steel cases probably wouldn’t have the same issue and for a military group who doesn’t reload their cases it is also not a problem. I’ve seen a number of barrels for these guns and reactivated a few. All of them have this same issue with the feedramps. I’m not sure the guns would handle the extra pressure of the 9mm parabellum cartridge. The bolt is very light and despite the angle between the barrel and bolt bores and I don’t think it would work well. 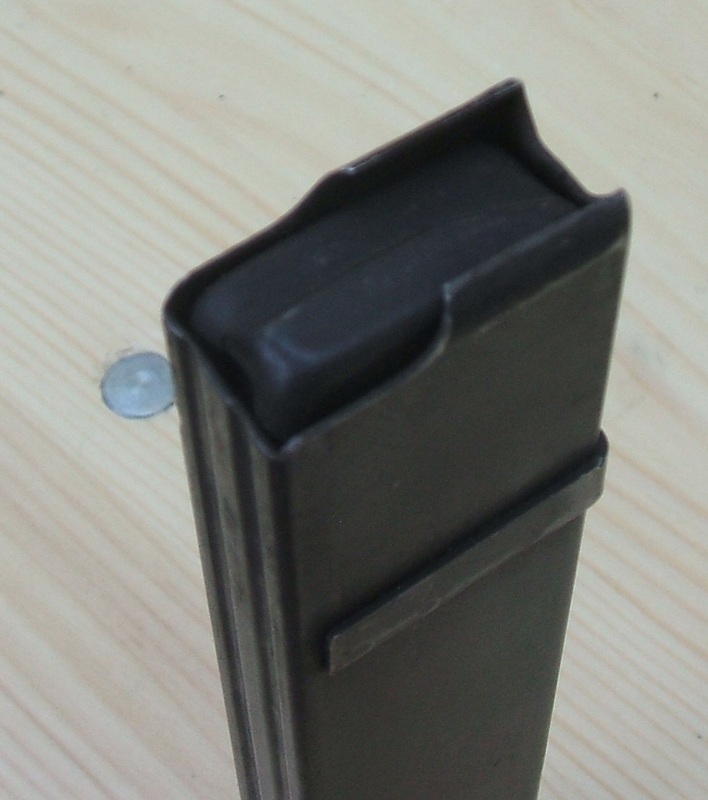 It is true that the 9 para will fit the magazine without any problems but the bolt needs more weight. A MAS 38 in 9mm would be formidable indeed. My experience with the US custom loaded ammunition is with the MAS 1935 A and 1935 S handguns. I have found that custom loaders tend to err on the side of caution. The loads are not as hot as the French issue.This caused both unreliable cycling and lack of accuracy. You are correct, the bolt lacks the weight for a more powerful cartridge. Thats probably the reason why the last round had case separation split that jammed the action, weak, probably reloaded or old case exploded, and if it left these bulges, it means chamber us not supporting it fully as it should. Design flaw. Do you guys know of A source to buy some mas 38 magazines? All I have is one. Would like to get three more. Another bit of info here. The front sight is not a triangular piece so much as it is a very odd slotted affair where the sighting point is a slot in the front sight with the aperature rear sights used to line up the slot on the target. Its fairly poor to use for accurate shooting but since the gun was intended for less than accurate use its adequate. Most users would likely not use any sights at all but more likely point the weapon. As for pistol ammo not being adequate to cycle the weapon it is not true. Firing new, old, factory and reloaded ammo I found that it cycled just fine with any of it. It also damaged the cases as noted above but resizing them allowed the to be reloaded 2 or 3 times before the cases cracked. Not so good as the normal subgun but they were never intended to use reloaded ammo and the ammunition was never meant to be reloaded. The barrel isn’t really slanted, the buttstock and boltway are. The intent is to reduce the recoil and muzzle jump and it might actually work. With the low power of the round its hard to tell if it does anything. There is no recoil or jump to speak of. The gun runs much faster than you might expect too. My guess is about 700-800 rpm yet even at that rate there is no muzzle climb and its easy to keep on target with one hand. I did some experiments with the 9mm parabellum and while the ammunition will fit in the magazines it will not feed. Once more than about 5 rds are in the mag the drag is so strong that the spring will not push them up to feed. I don’t think it would be unsafe to run with parabellum ammo but I don’t think it would work either…. See the attached us gun covers. we can provide you US gun covers with Fleece linning as well. we are making US gun covers from Canvas material.